Many kids and adults alike can recall having tea parties with their favorite dolls and stuffed toys. 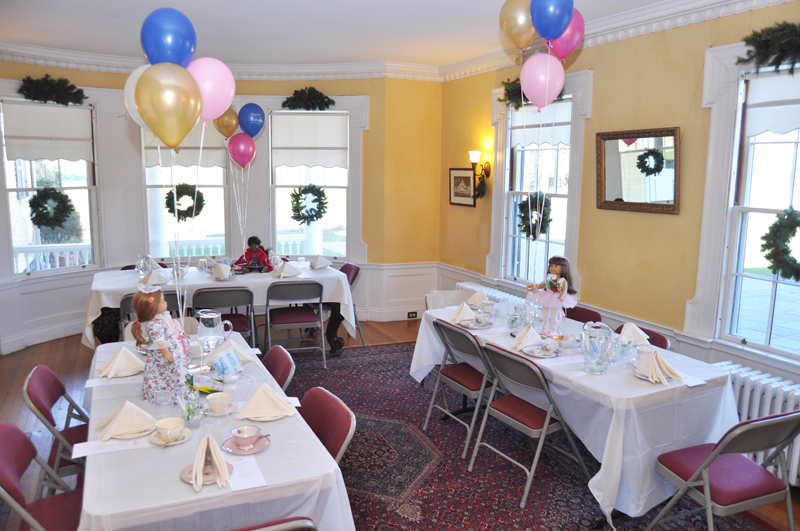 On December 4th, a special tea party was held, where girls and their favorite adults brought their most cherished dolls to the Pierce House in Lincoln to attend a "Dolly and Me Tea Party" benefiting Horizons for Homeless Children ("Horizons"). The girls and their dolls decorated canvas totes, crowns, and bracelets. They feasted on mini croissant sandwiches, cookies and brownies, tea, and hot cocoa. Andrea Thodorakos of Glamorous Cupcakes and Specialty Cookies provided cookies with the American Doll logo, adding a special touch. Those attending had the chance to receive door prizes of the 2017 American Girl Doll of the Year donated by Sofia's Angels, and Bruin's Tickets donated by Laurie Cadigan of Barrett Sotheby's International Realty. Terese Surette and Anna Travias, Realtors® at Barrett Sotheby's International Realty, located in Bedford, Carlisle, Concord, Lexington, and Lincoln, planned and coordinated the event, with 100% of proceeds donated to Horizons. Travias serves on the board of Sophia's Angels, a Massachusetts non-profit organization that works, "To inspire and practice kindness in ways both big and small, by helping others in need." Surette said, "I personally volunteered at a Domestic Violence shelter with homeless children weekly for this organization [Horizons], and so it is near and dear to my heart." The Playspace Program created by Horizons, which Surette volunteered through, is a yearlong commitment where PALs (Playspace Activity Leaders) spend two hours per week with kids 0-6 years of age. These time slots are often in conjunction with financial literacy courses, parenting classes, case management meetings, and other programming that parents need but would not otherwise be available for without the support of the PALs. Monetary donations made to Horizons go towards programming and the necessary items to execute the scheduled and planned activities. To learn more, visit Horizons for Homeless Children online.